Something I did last fall for Campbell was make him, what he called, "Fall Snack" and he loved it. I was reminded of it a few days ago and I need to go to the grocery store to grab some items to make Campbell's beloved "Fall Snack." It's simply a mix of different sweet and salty goodies. I mixed it all up and kept it in a huge ziplock bag so that it would stay fresh and we could eat on it for a long time. We all enjoyed it and it was a nice change to the typical snacks we have laying around the house. I'm not saying this is a healthy snack option but it's fall and fall is fun so lets live a little and have some fall snack! It's great to have laying around your house or a fun and festive treat to take to a fall party! 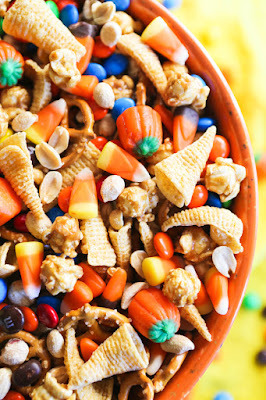 Here's some ideas on what you can put in your fall snack mix!